Every effective preacher needs tools to craft faithful, text-driven sermons. However, since pastors have limited time each week and there are thousands of potential preaching resources, knowing the best commentaries and books to help in sermon preparation can be a daunting task. 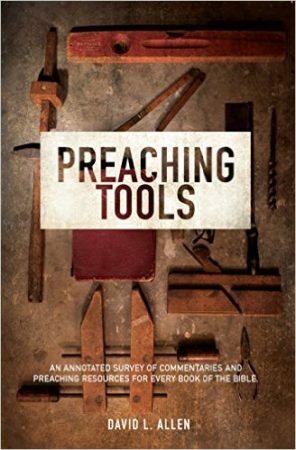 In Preaching Tools, David Allen draws from the well of more than 40 years of experience in the pulpit, both as a pastor and preaching professor, to provide the top commentaries and resources for every book of the Bible. Resources are categorized for quick reference, and Allen’s annotations provide insight into the books strengths, weaknesses, and backgrounds. Some sample chapters have been provided to offer an example of the resources available in Dr. Allen’s Preaching Tools.